An annuity is a contract with a licensed, regulated life insurance company. Unlike stock market investments with "hoped for" outcomes, annuities guarantee several outcomes, including the payment of interest and lifetime income payments that you can never outlive. That's what differentiates annuities from common investments like mutual funds. Annuities can provide true diversification for your retirement. At this stage of your life, you are shifting away from a sole focus on aggressive growth. Your tolerance for risk is likely declining (that's smart.) From this point forward you want to preserve and protect your money and provide yourself with reliable income. What is an annuity? 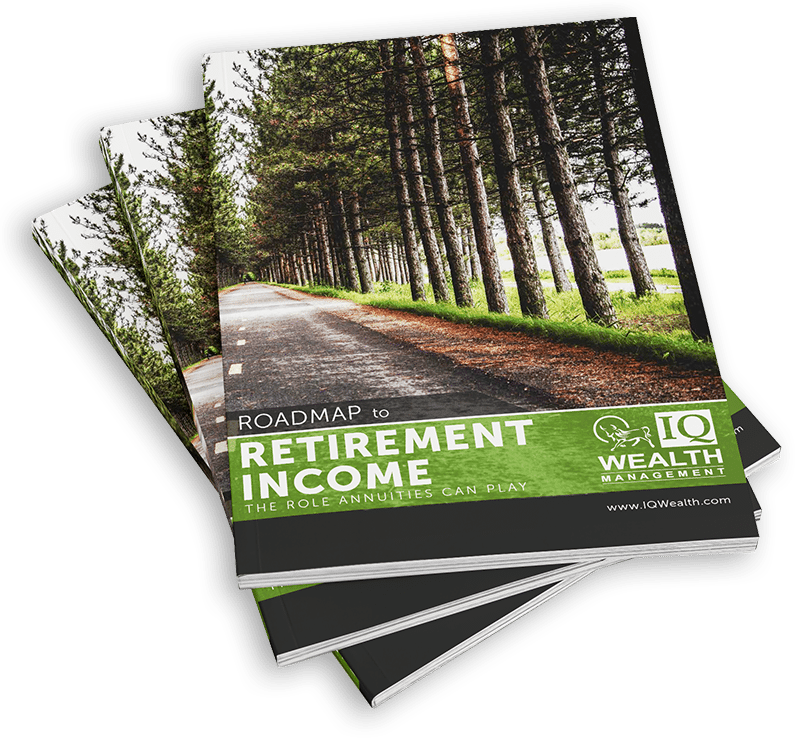 It is an income and preservation vehicle for retirement that can be used for your 401(k), 403(b), or IRA rollover with no tax penalty of any kind. An annuity is part investment, part insurance. Scroll down for our special reports. What are the Four Kinds of Annuities? Most people get confused about annuities because journalists and many investment advisors who do not specialize in annuities are, well, confused themselves. In fact, when people hear the word “annuity,” many people, including journalists — are not even clear on what is being discussed. Annuities are not “investments” in the truest sense of the word. 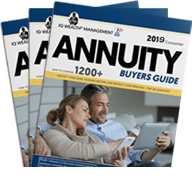 Annuities are contracts with legal reserve life insurance companies, many of them more than 100 years old, to guarantee you a certain amount of income over your lifetime and even your spouse’s lifetime. Young people in their 20s, 30s and early 40s are typically not candidates for annuities. It’s only when you are thinking about securing a lifetime income that you should be thinking about an annuity. You can start an annuity at 40 or 45, but most people start annuities at 50 and older, all the way up to age 85. Get answers to the 25 top Annuity Questions. 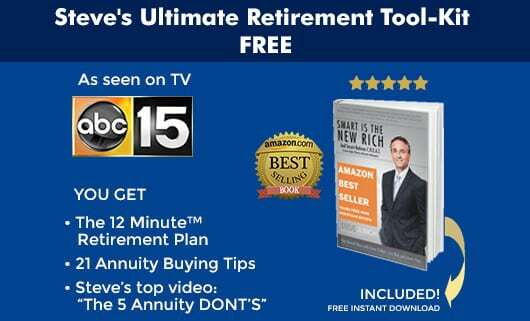 Visit ANNUITY UNIVERSITY here. Many people have heard that “annuities keep your money when you die.” This is false for 90 percent of all annuities! Get your facts from credible resources who actually are well versed in the subject. 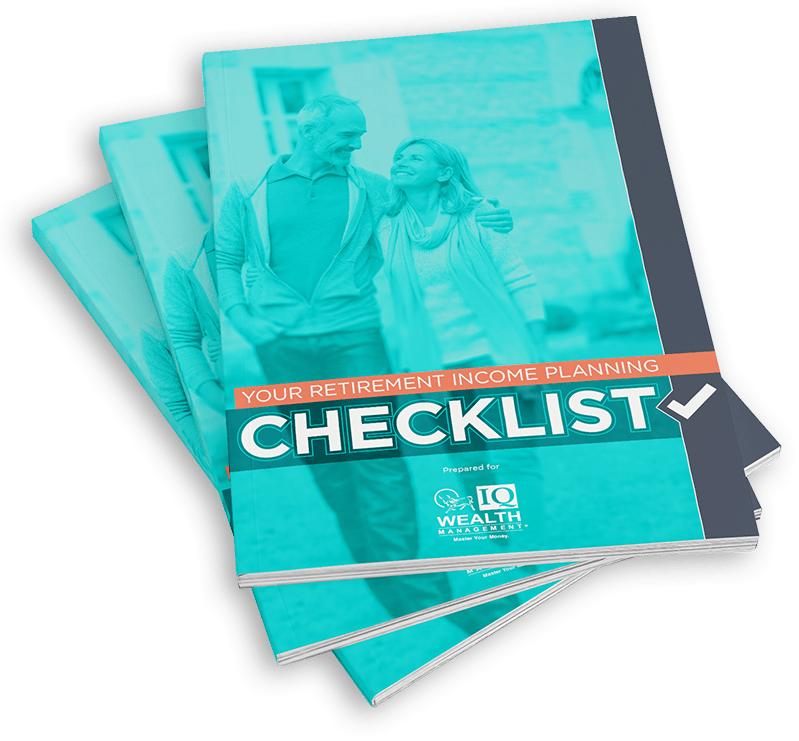 The only type of annuity where you could disinherit your heirs would be an IMMEDIATE ANNUITY. The other three types of annuities — variable, fixed and fixed index — are all DEFERRED annuities. You can arrange to maintain a death benefit for as long as you own a deferred annuity. We can help you with the design of your annuity portfolio. Provide for long-term care supplemental cash flow, in some cases doubling your annuity income for a period of time. Annuities are created for the retirement phase of your life. Annuities are not designed to MAKE you money, like a stock or mutual fund. They are designed to give you lifelong financial security — either right now or down the road. You choose. Fixed annuities are similar to bonds or CDs. You place your lump sum with a legal reserve insurance company. They pay you an interest rate. You cash in after a certain number of years. Fixed INDEX annuities with enhanced income insurance known as “income riders” are the new wave in annuities. You maintain access and control of your lump sum. Your principal is protected against loss (your money is never invested directly in the markets), and you can flip a switch to a lifetime income when you decide the time is right. The growth of your accumulation value is determined by an indexed formula that you choose. 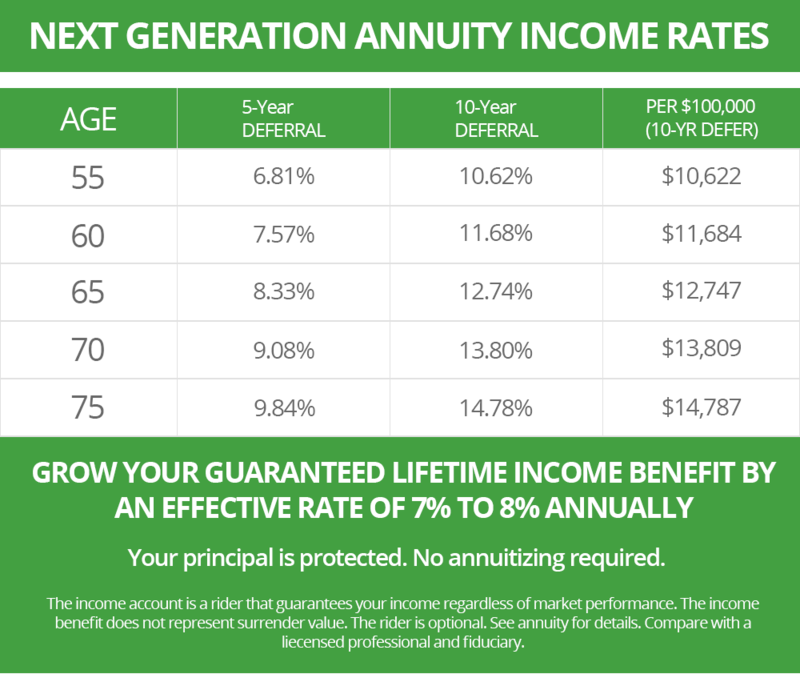 At MyAnnuityGuy.com, and IQ Wealth Management, annuities are not a sideline. We take being the best very seriously. With many years of experience, an A+ rating with the Better Business Bureau and a local presence, we can help you sort out the annuity questions you have, while helping you arrive at a well-balanced and cost-effective annuity decision. YOU are the most important part of our business. Nothing matters more to us than the safety and security of your money. Our goal is to help you manage your resources and build security for you and your family. 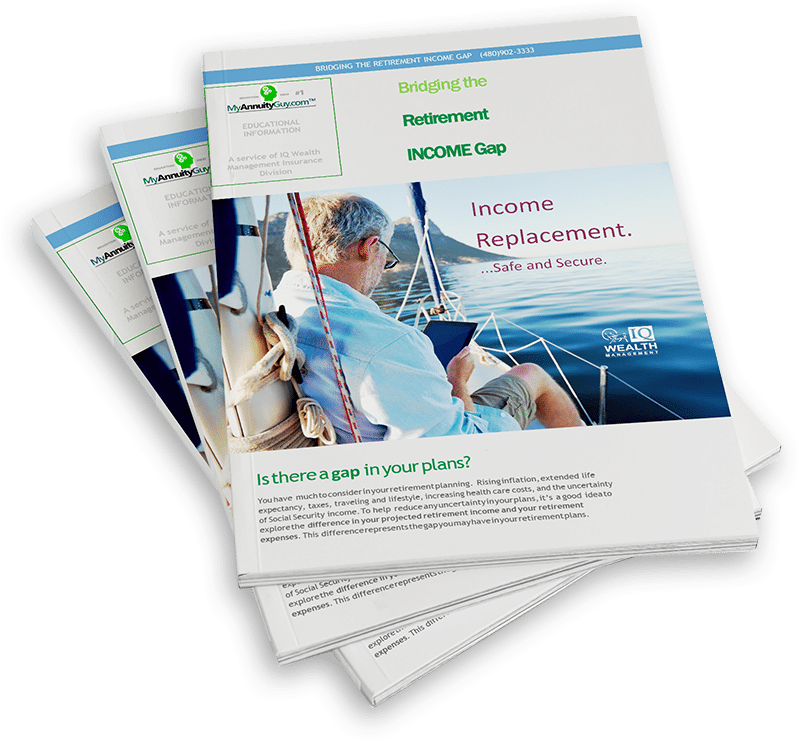 How Big Is Your Retirement Income Gap? Do you know where the cash to pay for it will be coming from? If you are spending $100,000 a year, you will need more than $3,000,000 to come from your investments over the next 30 years… not counting inflation or taxes. …Learn how to increase your retirement income without taking the the risk of mutual funds and without the high fees of variable annuities.